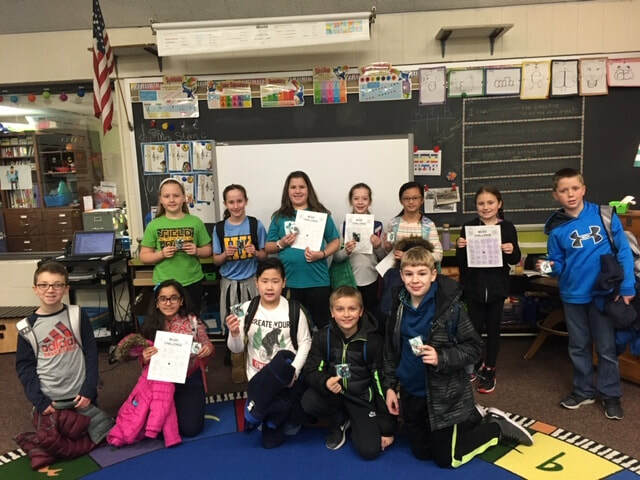 This morning in band I handed out the prizes for the students who completed the February practice Challenge! We had 15 students complete the challenge and turn it in on time. Several students were very close to being done, but just needed to complete a few more challenges!! We have decided that enough students are interested that we will do a March challenge as well!! Students are very excited for the next challenge that will begin next week and finish the week before spring break! Check out some of our February practice stars! Next Friday (February 1st) we will begin our February practice challenge! Students will have a month to complete black-out bingo on the bingo card by completing each challenge and then coloring in the square. Prizes will be awarded to any student who completes the challenge within the month. Many of these challenges involve playing for other people, so please help your child find new and interesting ways to stay fresh with their practice routine! I'll be sending this document home with your student next week! Please check out the details for our winter concert on 12/11/18! This week your band student brought home a letter containing the log-in information to register their method book online and gain access to a ton of band resources. We use some of them in lessons. For example, your student can select any song from their method book and play along with a backing track for some added practicing fun. You will also gain access to instructional videos and practicing tips with this resource. Please check your child's folder to find the letter containing this important information and visit www.essentialelementsinteractive.com to register! 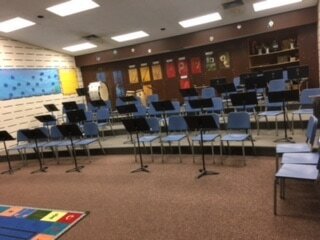 ​Last night was our instrument night at BES. Students came to try out band instruments and decide which one they would like to play this year! We had lots of families show up and try out the instruments! If you were not able to come and your child is interested in playing a band instrument this year, that's alright! Students will be bringing home the band sign-up sheet and information about two instrument vendors. Please fill out the sign up sheet and return it to school by September 7th. You can choose to rent an instrument from either company. If you choose Connecticut music, please fill out their form and send it in along with a check or the required payment information. You can order from Middlesex Music Academy online by following the information on their flyer. We have a small number of instruments at the school that can be rented by families with financial difficulties. Please call or email me (astern@rsd17.org) if you have financial concerns! Happy spring! It seems like the weather has finally decided to join us in the spring season! We are just four short weeks away from our spring band concert. I know that everyone is extra busy this time of year, but now is the time for students to put in a little extra practice time. Students need to build up their endurance playing on their instrument so they can make it through the entire band concert. Please check in with your student, ask them to play some of our music for you and encourage a little extra practice time! We have been in full band for about a month and a half now! We are working on three band pieces and we have a fourth one to add still! It's very exciting and very new! Many students are discovering that it is more difficult to play their part with others than it is to play by themselves. Especially when another instrument is playing something different! Here are some tips and tricks for practicing! 1. Take a few measures (1-2) at a time and start with the rhythm. Make sure you can say, clap and play the correct rhythm before you worry about the notes. If 2 measures feels like too much, just do one or just a few beats! Once you feel comfortable with those, try the next section. Then put it together with the first part you practiced. 2. Practice saying the note names along with the rhythm of the song. Make sure you are tapping a steady beat still! 3. Say the note names and move your fingers or slides on your instrument. 4. Try to play the music. 5. Slow and steady wins the race. When in doubt, slow the music way down, tap a slow steady beat with your foot and try to play with it. Eventually we will need to speed it up, but if you learn it slowly, you will be able to practice until you get it up to speed! 6. Listen to the recording of the song and follow along with your part. I will attach some links below! 7. Get a metronome. Set it to a tempo where you feel comfortable playing faster notes (eighth notes) and when you master a few measures, speed it up (just a little) and try it again! 8. Practicing is hard work! Practice without distractions consistently for 5-7 minutes and then take a short break to finish your practicing session. Eventually you will build up your endurance and be able to practice for 10-15 minutes without taking any breaks! To listen to the band pieces, click on the links below and then click the play button next to "Band set and score". We had a great first full band rehearsal this morning! We are starting to sound great already and I am so excited to hear how well we will be playing by May!! It is very important at this time to keep up regular practicing! The more practicing at home, the better we will play as a group! We have some really exciting band pieces for our spring concert including; Fanfare on Ode to Joy and Attack of the Garden Gnomes! Encourage your child to practice and to show you what they have been working on!! The first band homework assignment is coming home this week! Students will be required to practice at least 3 days a week for at least 15 minutes (a total of 45 minutes per week). This week is all about remembering how to put the instrument together and practicing making a good sound! The other assignment is that students need to sign and return the band contract and their practicing plan. Both of these should be discussed with a parent or guardian and signed by students and parents. The contract and plan are BOTH due back to me by the student's next lesson! Band Sign-ups coming home Today!! I gave some very excited fourth grade students their band sign-up sheets today! Look for it in your student's backpack tonight! Students wishing to play percussion (drums) should have a second choice as well as I will be taking only the first four students that I hear from. The fastest way to let me know that your student is interested in percussion is by email (apolderman@rsd17.org). All other students can send the form back in any time before September 8th. Below, I have attached the letter that went home (just in case) and I have extra copies of the rental forms as well. If your family is experiencing financial difficulty please let me know!! I can't wait see what instrument your students picked!! One more week until the Concert! We have just one more week of practicing until we play our concert on May 31st! Please make sure your students are putting in a little extra effort and working out those tricky spots this week!! We have been working hard at school, but we need some to take some extra time with our music and instruments this week! Also, please make sure students bring in their permission slip so that they can travel with us to the dress rehearsal the day of the concert! Happy music making! 1. Ask your student to play something from the concert for you and your family as a little "preview"
2. 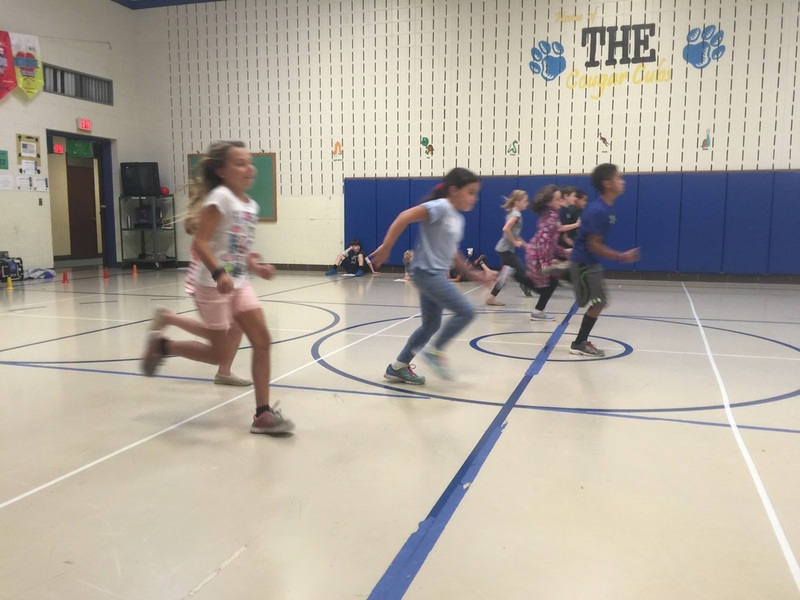 Check in with your student to make sure they are meeting or exceeding the 45 minute practicing minimum each week! 3. Make sure that you sign off on their practice log if they have logged their practicing minutes! 4. Ask your student to teach you something about their instrument!! They love to show off their skills!! Have fun making music at home!! We are all feeling like winter is dragging on this time of year. Help your child through by asking them to play for you. Your band students have been working very hard on two pieces of music and some songs in their method book. Check in with them to see what they are doing and maybe even try playing or singing along if you are comfortable! Have some fun with music and your child! Mark your calendars for the Spring Band Festival that will take place on May 31st at 6:30 p.m. at HKMS. All three elementary school bands will come together for just one night to make some beautiful music!! Full Band meets Every Thursday at 7:55 a.m.
We are finally meeting as a full band every Thursday morning! That's a very exciting and important step for our Fourth graders! We are working towards the district elementary band festival in the spring! (Mark your calendars: May 9th at 6:30 p.m. at the middle school) Please make sure to bring your student in prepared with their instrument, music, and a pencil promptly by 7:55 every Thursday morning. Also, please me know if your child has to miss a rehearsal. Encourage them to practice the band music and their lesson books 4-5 days a week. Additionally, there are some Coast Guard band concerts that are occuring this season that would be an excellent family experience. Many of them are free and local! Check out the schedule below! The Band Instruments are Coming, The Band Instruments are Coming! Band starts next week (Thursday, September 22nd)!!!!!!! Please make sure that your student(s) arrive(s) promptly at 7:55 a.m. with their instrument and folder/lesson book so that we can begin at 8:00 sharp! Before school care is available for siblings! Drop off is in the back of the school at the cafeteria doors!